Sunday morning religious news and current affairs programme presented by William Crawley. 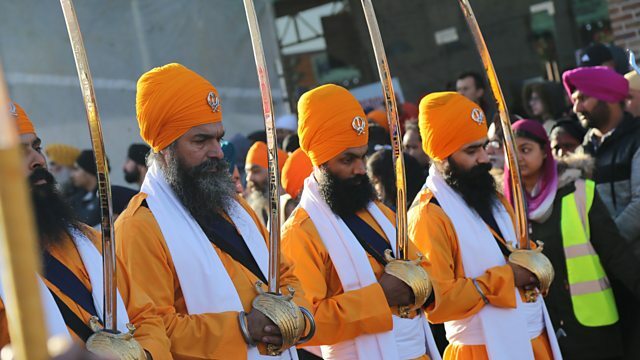 This weekend Sikhs all over the UK and the world are celebrating Vaisakhi. It marks one of the most important religious, historical dates in the Sikh calendar. William Crawley will be talking to Dr Jagbir Jhutti-Johal, Senior Lecturer in Sikh Studies at the University of Birmingham. The hit BBC sitcom Fleabag has reignited a debate about priestly celibacy. Alex Walker quit the priesthood when he fell in love with his now wife. He talks about his life , the show and how the portrayal of the priests story line have been received. Jo Frost from the Evangelical Alliance and Lorraine Cavanagh from Modern Church discuss whether you need to believe in the Easter story in order to be a Christian..
And award winning rapper Guvna B talks about the current influence of religion in black music. Photo Credit: Sikh Press Association.